Public sector employees in many locations in the U.S. are facing stiff pension cuts, with some changes already in place and others scheduled to take effect in the near future. In the past, local, state, and federal government employees relied on pension benefits to make up for base pay rates that were typically lower than those seen in the private sector. Financial pressures have some state and local governments changing pension benefits, particularly for new hires, and the federal government may soon be making similar cuts. While the teachers’ strike in Kentucky is calling attention to the latest round of pension cuts, this trend has been accelerating for several years. Private sector employees in jobs requiring higher education have historically enjoyed greater base pay than their counterparts in the public sector. The lower base pay in the public sector has traditionally been offset by better health care and pension benefits, as well as enhanced job security. These enhanced health and retirement benefits have helped attract qualified applicants to government jobs. Now that many private firms are scaling back or even eliminating pensions, some state and local governments are looking to reduce expenses by lowering public sector pensions to a similar level. More than half of the pension plans cuts concern the age needed for retirement pensions to fully vest. Increasing retirement and benefit-vesting ages can significantly lower pension costs for governments. Traditionally, the top three earning years of government workers are used to calculate the payment amounts they receive from their pension. This time period is pretty standard in the private sector as well. Most government pension cuts include a provision to base payouts on the top five years rather than the top three. The lower payout amount would persist throughout retirement. Cost of living adjustments are increases that are made in pension payments to keep track with inflation rates. If inflation rates rise significantly, removing these increases from pension plans can leave retirees with pension payments that do not keep up with living expenses. 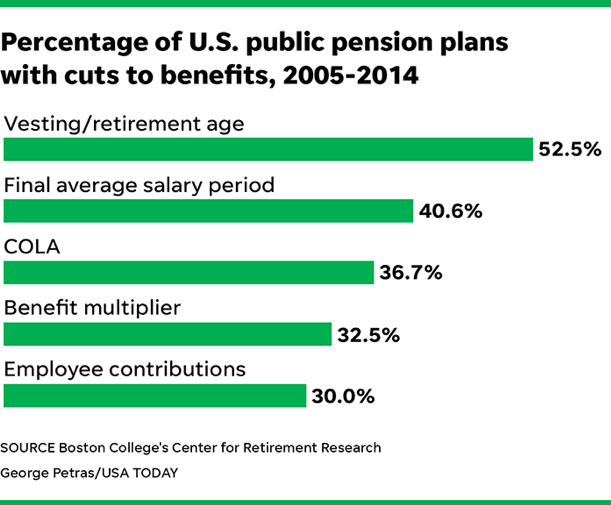 Many public sector jobs still offer pensions rather than the 401K retirement savings plansthat have been commonly adopted by private sector companies. 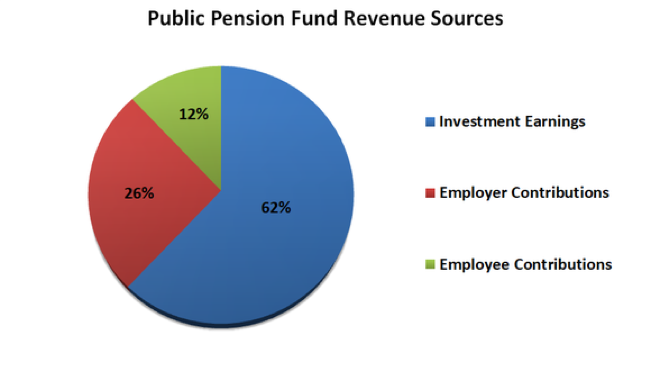 Most of the costs for pensions are typically borne by the government, with employees contributing a minor amount. In an effort to cut pension costs, some local and state governments are increasing the amount that workers will have to contribute to their pensions. The amount of pension employees receive is generally determined by the amount of salary and the amount of time on the job. Reducing the benefit multiplier can subtract thousands of dollars from the amount of pension a worker receives. Public sector pensions were traditionally considered safer than private sector pensions, because cities and states do not go out of business and cannot be bought out. Cities and states can default on pension payments, however, even though it may be against the law. Investment gains account for the vast majority of pension assets, and economic downturns can have a negative effect. A growing number of cities and states have run into funding problems that they seek to mitigate by reducing pensions. Will my pension be enough to fund retirement? 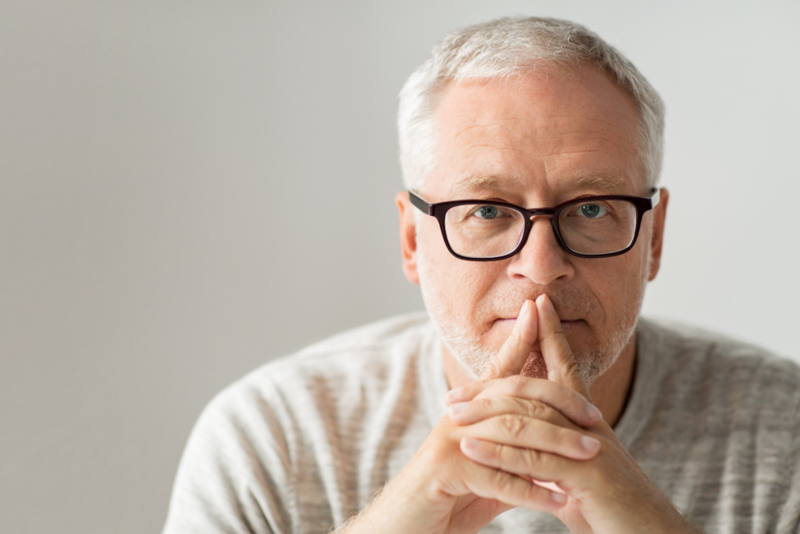 If you have a job with local, state, or federal government, you have good reason to wonder if your pension will be sufficient to fund your retirement. For the most part, public sector pension cuts affect new hires, although many retired public sector employees have seen their COLA adjustments shrink. Increasing your personal investment in retirement savings is always a good idea.